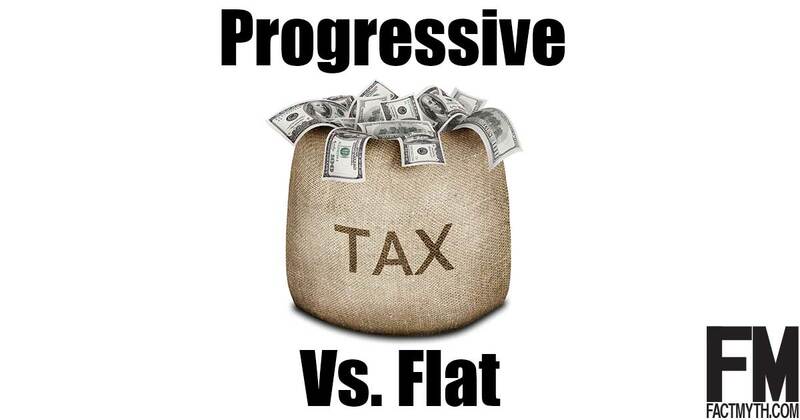 A Progressive Tax is More Fair Than a Flat Tax - Fact or Myth? A progressive tax is fairer than a flat tax on paper, but not necessarily in practice in a given country at a given time. What is More Fair, a Flat Tax or Progressive Tax? Below we’ll look at a number of different aspects of the United States tax system to help explain why progressive taxes are generally more fair than flat taxes. The page is a little long, as we cover every point and possibility in detail, so let’s start by looking at the bottom line on a flat tax vs. a progressive tax. Feel free to skip around the page or comment with questions. Under the current tax system about 1/2 of American families currently pay little to no federal income tax (as an “effective tax rate“) due to deductions, credits, and the progressive bracket structure. For the bottom 50% of earners it isn’t the income tax, but payroll taxes, excise taxes, sales taxes, and property taxes that comprise their tax burden. In fact, the progressive tax brackets actually help those with lower incomes, because they can use credits and deductions to lower their marginal tax rate (AKA what income tax bracket they are in). A true flat tax (one that applied to everybody at a flat rate) would, considering the above, shift the tax burden from high earners to the lower and middle classes despite their inability to pay (in some cases). Those who pay nothing under the current progressive tax system would either pay the flat rate or be excluded based on income, while those who pay little under the current system would not be able to use deductions and credits to reduce their effective income tax burden (thus their rates would effectively go up if no other changes were made). This doesn’t make much sense considering lower-income Americans already pay a disproportionate share of their income in taxes (with all taxes considered) and extend themselves on credit and pay interest on debt (with many lower income families saving nothing or even going into debt each year). The only way to make a flat tax work is to cut spending, raise other taxes, or to increase the tax burden on the middle class (as unlike the lower classes, they still have some money to tax). Thus, the flat tax is just a tax cut for the rich dressed up as a tax cut for the other classes. Any income tax that shifts the burden onto those who are already over burdened with taxes and don’t have the ability to pay is generally not as fair as a system that accounts for differences in income and wealth. This doesn’t make every type of flat tax less fair than every progressive one, nor does it make our current tax system perfect, it just means that a flat tax is less fair than a progressive tax in general if no other considerations are made (and of course, if one makes enough other considerations, like multiple brackets and exclusions for low incomes, they have essentially constructed a progressive tax). Below we cover many more details and lots of data that helps to illustrate these points. TIP: Generally the lower the top tax bracket is, the less brackets there are, and the more flat the tax, the less fair it is. This is true for income and wealth. Consider the sales tax, excise tax, and payroll tax that already burden the bottom 50%… are examples of flat taxes. On this page we focus the conversation on the federal income tax, but do be aware that the federal income tax is only one of many taxes in America (consider corporate income taxes and state income taxes, and payroll taxes, sales taxes, excise taxes, estate taxes, property taxes, and other taxes). This is to say, the federal income tax is only one part of a given American’s tax burden. Also, keep in mind, wealth and income are two different things. The income gap in a year contributes to the wealth gap over time, the personal federal income tax doesn’t address wealth over time. Specifically, the estate tax and long term capital gains taxes are two of the only taxes that truly address wealth. With all that covered, let’s dig in and look at all the aspects of flat and progressive taxes. TIP: The income tax on the top earners, the corporate tax, the estate tax are all lowered by the 2017 proposed Trump Administration budget. The effect of those proposals is that they would flatten taxes. The Income tax isn’t the only tax, those who don’t pay the income tax tend to be paying other taxes. For example, the bottom 50% of earners generally pays their share via payroll taxes, excise taxes, sales taxes, property taxes, and in interest on credit. Again, under the current tax system about 1/2 of American families currently pay little to no federal income tax (as an “effective tax rate”) due to deductions, credits, and the progressive bracket structure. Any of those families who had to pay a flat tax would see their average effective tax rate go up. Those with lower incomes depend on the progressive tax brackets (tax breaks, deductions, and tax credits help reduce a person’s “average marginal income tax rate” and thus their “effective income tax rate;” one can’t drop down a tax bracket via deductions if there are no tax brackets). Those with lower incomes are already disproportionately burdened with rather flat taxes like payroll taxes, sales taxes, excise taxes, and property taxes despite lacking the ability to pay. When we decrease income taxes on the wealthy we have to increase other taxes, a tax like a sales tax increase could slow down the velocity of money (the economy could slow down if consumers face higher taxes at the point of sale). Those with higher incomes would get a giant tax cut despite having the ability to pay. That would not only increase the wealth gap over time (if no other changes were made), but would result in the country either having to raise other taxes, cut spending, or create more debt. Here cutting spending could affect that assistance programs those currently paying little or no income taxes rely on, again slowing down economic growth. MUSING: The wealth gap has grown since the 1980’s, and so has national and personal debt. If you don’t own capital assets (stocks or a home) and you have debt, then you should ask yourself, “what is it exactly that trickled down?” We know the minimum wage didn’t trickle down, so what did? I’m not suggesting nothing did, but I am suggesting you think about this question. Simply put, those with higher incomes have a higher ability to pay, the poor are already overextended on credit, and the middle class has little in the way of extra money to pay higher taxes or to lose assistance (like healthcare, childcare, and general tax breaks). Thus in terms of an income tax alone, there aren’t many other choices outside of raising other taxes, cutting spending, or creating more debt. In words, shifting the tax burden onto low and middle income Americans via a flat tax is less fair than having a progressive tax system which shifts some of the burden onto those with higher incomes. Or, at least, fairness aside, it isn’t practical (as one can’t squeeze blood from a stone, even in the name of fairness). Sure, we could flatten the income tax and lower everyone’s rate, but that still leaves us with a deficit. Sure, you could modify a flat tax to make it more progressive a fair, but then, it is essentially, as noted above, a progressive income tax. You can see a visual of the impracticality of this below in the chart that shows the tax burden by percentile. Like just about everything else in this imperfect world, the flat rate income tax has its advantages and its disadvantages. In terms of equity, however, the effects of the single tax rate may be considerable. While, in the abstract, the flat rate may appeal to some people as more fair, in practice it would redistribute a significant share of the tax burden from upper-income to middle-income (and possibly even low-income) taxpayers. Many of these middle-income taxpayers already have limited financial flexibility due to contractual mortgage interest and property tax obligations. – TESTIMONY OF Joseph Minarik Deputy Assistant Director Tax Analysis Division Congressional Budget Office Before the Subcommittee on Monetary and Fiscal Policy Joint Economic Committee 3 July 27, 1982. On the fairness and equity of a flat tax (as proposed in the Reagan era), describing how it would funnel money from the lower and middle income earners to the top earners (which Reagan’s tax plan arguably did; while also arguably stimulating the economy… life is all about trade-offs; see: What Is Reaganomics? Did It Work?). TIP: Effective tax rate is the rate one actually gets taxed on after deductions. Average marginal tax rate is the average effective rate one pays under a progressive tax system. A progressive tax is a tax where the tax rate increases as the amount subject to taxation increases. A regressive tax is a tax where the tax rate decreases as the amount subject to taxation increases. A “true” flat tax (a proportional tax with one rate) is a tax where the tax rate is fixed, with no change as the taxable base amount increases or decreases. See a page explaining the mechanics of progressive taxes and the marginal tax rate for definitions. The image below from the Tax Policy Center shows effective tax rates in terms of federal income, payroll, corporate, and excise by percentile. Below that one you can see an image with a breakdown of total federal tax burden (also from the Tax Policy Center). Below that one you can see an image that shows income by percentile (by DQYDJ). As you can see the income tax helps ensure each economic class takes on a fairly equal percentage of the tax burden, especially in relation to their ability today, and that even at the current rates the wealth gap widens. You’ll also notice our system is already somewhat progressive (due to the income tax) but is otherwise flat. 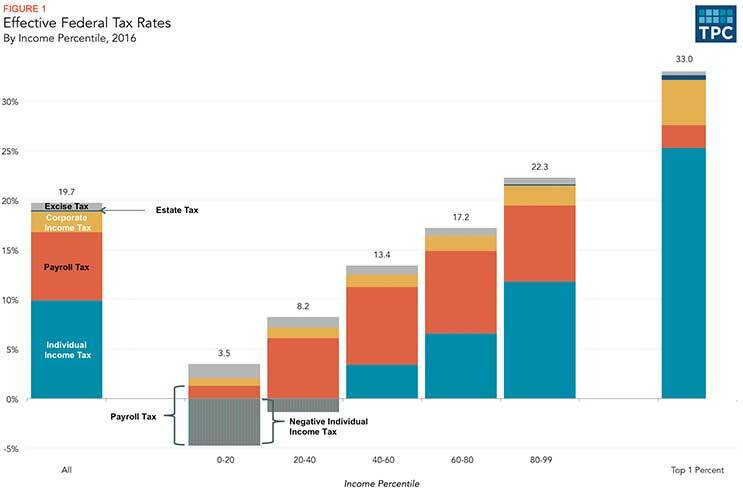 Notice how the flat payroll and excise taxes don’t do much to tax the 1% in the effective tax rate graphic? That is essentially an indicator would happen with the income tax under a flat tax. The problem overarching problem here is that the poor don’t have the ability to pay, thus a flat tax would have to shift taxes onto the middle class, cut spending, or have to have a relatively high rate. This could be offset by gains, see “supply-side economics,” but that economic benefit doesn’t really address the issue of fairness of the tax burden, nor does it specifically address issues of debt or the wealth gap. TIP: See that blue bar on the top 1% side, that is the income tax. The flat tax argument says lets take half that bar and shift it to the bottom 60% of earners with a lower ability to pay who are already over-extended. If that seems fair to you, then please comment below with your logic. Make sure to check the image below that shows how much income the poor and middle class actually have. TIP: See How close are you to the top 1%? Notice how even within the top quintile below the tax burden is distributed in a rather progressive manner? This isn’t just fair, it is arguably the only practical solution. If we cut taxes on the 1% and shift the burden to the other classes, despite their inability to pay, the wealth gap would grow and the economy would be at risk of slowing down. Wealth does trickle down to some extent, but it also trickles up when the 99% aren’t over-taxed. 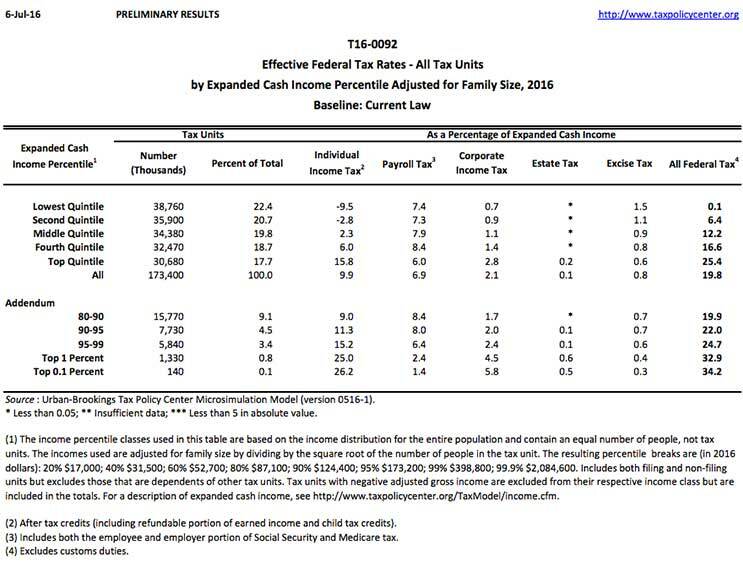 Effective Federal The above image shows Tax Rates, for all tax units, by Expanded Cash Income Percentile, Adjusted for Family Size, 2016. Notice how most federal taxes are rather flat or regressive, and the only saving grace for the majority of Americans is the very progressive income tax structure. The basic flat tax argument takes this away and leaves the rest. Not fair on my account, what do you think? Consider, the chart doesn’t factor in cost of living or state taxes like sales tax and property tax! If we put aside all other taxes, and we imagine a flat federal income tax that could reasonably sustain the U.S. economy (let’s say 25%), in this case many low-and-middle income families who currently pay less than 25% would see an income tax increase and those currently paying more than 25% would see a tax cut. If we instead imagine a 10% flat tax, like Ted Cruz suggests, we can point out that low income families wouldn’t see a decrease, but we can also see that high earners would get a near 30% tax cut (which means other taxes must be raised, spending must be cut, or debt must be acquired). If one considers total tax burden and ability to pay, then a flat tax is (from that frame of reference) isn’t very flat… it is actually rather regressive (the more you make, the bigger the smaller your tax burden). In fact, one could argue that the only tax in America preventing a completely regressive tax system is the progressive federal income tax! TIP: The long term capital gains tax is much lower than the income tax, meaning this would create not only an income gap, but a wealth gap over time. Consider the examples below, if we assume no other changes, those with effective (after deductions) incomes of $9,275 to $37,650 would pay more, and those with incomes of $91,150 would pay less. We can consider this a number of different ways, such as with that 10% number or with a higher number like 33%, but all considerations essentially lead to the same conclusion. That is: A true flat tax burdens those with lower-incomes despite their already high tax burden and their low ability to pay, which is… 1. “not fair,” and importantly, 2. not practical. TIP: Notice we say a “true flat tax,” if one were too eliminate all loopholes and offer a progressive structure for low earners, then those with lower incomes could still get a break, middle incomes could pay a fairer tax, and those higher incomes wouldn’t be able to dodge taxes (and thus might actually pay a higher effective tax rate in some cases). This is to say, there are some ways to make a hybrid flat-progressive tax fair, but you should note that such a tax has rarely been suggested. Source: Tax Foundation (Author’s Calculations). TIP: It is a myth that low-earners don’t pay taxes, they pay taxes, they just don’t pay an effective federal income tax rate after deductions. That is an subtle but important difference. If those with lower incomes had more money to pay in taxes, they would, you know, not be poor. Likewise, the middle class is often extended on credit. There really is only one class with the ability to pay higher taxes, that is those with higher incomes and more wealth. This is why a progressive tax makes more sense in general. The devil is of course in the details, as loopholes and the placement of brackets matter greatly (HINT: When we consider that some are making tens of millions and others billions, and most of that is in capital gains, we can affirm that there are more pressing problems in terms of fairness than the income tax). Above we covered the basics, below we will explore each aspect discussed above. Since lower incomes have a lower ability to pay, already spend the majority of their incomes, and even sometimes spend more than their incomes on credit, it really doesn’t seem “fair” or “practical” to shift the tax burden on them… especially when we consider the rather flat / regressive payroll tax, sales tax, excise taxes, and property tax, and all the other state and federal tax types which tend to disproportionately burden lower incomes. When we take into account all tax types, we can say: a main reason the average family is struggling with costs and extended on credit, while the rich save more, and the wealth gap widens is… the already rather flat tax structure of most taxes, including the progressive income tax which inclines sharply and fails to account for the wealth gap within the top 1% (see example tax rates below). Federal taxes are progressive on aggregate (as you can see in the Tax Policy Center images below), but the progressive federal Income tax is essentially the only thing ensuring this under our current system. If we flatten that tax, then lower incomes are squeezed even harder… while higher incomes get a tax break. Simply, that is what is “not fair”, especially in a country that racks up debt each year and lags behind other countries in providing access to things like education and healthcare! With all of that said, there are some valid lines of reasoning regarding the logic behind a flat tax and its fairness. For example, we can consider plans that flatten the income tax but address issues with other taxes, or muse on more ideological points like “is it fair that individuals with a negative tax rate have a say in tax policy“…. although, that is a slippery slope, as the same could be said for corporations who need to take a loss in a given year for example. We offer more details on the above argument below, first some graphs from the Tax Policy Center showing a visual of why a flat tax isn’t in practice. CONSIDERING OTHER TAXES: The argument above generally applies to federal income-related taxes. So it applies to the federal income tax, the federal capital gains tax, and the federal corporate income tax. For capital gains, we should note that the ultra wealthy make a lot of their income in capital gains, so if we tax regular income but not that, then it is “unfair” for those who don’t invest or invest less. For the corporate tax it is a bit more tricky, but generally we can say small businesses with a tighter profit margins have less “ability to pay” than larger businesses with more profits, and thus we can equate this with the argument for a progressive federal income tax. We won’t make the case for each tax type in full here, but keep in mind the general argument applies for each income-based tax. FACT: An estate tax is also a “fair” tax. See an argument for the estate tax. It is one of the only taxes that addresses the wealth gap! The above concept that a progressive tax is more fair is generally true for any tax type or nation, but as noted above it is specifically true in America when we consider things like deductions, exemptions, loopholes, subsidization programs, and the other tax types related to income, wealth, and property that businesses, individuals, and families face (like payroll and sales tax which burden lower-incomes, property tax which burdens middle-incomes, and the corporate tax, investment income taxes, and estate taxes higher income face). When we consider a flat income tax, payroll tax, sales tax, and property tax for low-and-middle income families, and then compare that to a flat corporate tax, a flat income tax, and the current estate tax for high income families, we can see how truly unfair a flat income tax would be in terms of equal share of the burden vs. ability-to-pay (in our current system; with no other changes). Just take another look at the Tax Policy Center charts above and below. Imagine the blue (income tax) and yellow (corporate tax) go down for the top 20%, and then up for roughly the lowest 80% while the Payroll tax stays the same…. now imagine the leftover money is money to spend (and is thus subject to a sales tax, property tax, and other taxes which burden low-and-middle income Americans, but not higher earners). The rich would build wealth, the poor would pay more, and over time the wealth gap would widen… how is this fair? Likewise, the same is true for subsidization. Flat subsidization like “everyone gets X in their HSA”, sounds fair on paper, but arguably isn’t when we consider the bigger picture (namely, different income families have different needs). Ideally taxation should be progressive, subsidization regressive (tapering off slowing, avoiding cliffs), and otherwise as simple as possible while remaining fair. Of course, this assumes the underlying problem is tax structure alone. In reality special interests, loopholes, monopolistic practices, cronyism, and other factors can be just as big if not bigger hurdles in quality of life, tax burden, and general spending vs. revenue debate. FACT: Under a flat tax wage earners are taxed twice (income and payroll) and dividends only once (income). Pair this with the fact that payroll, property tax, and sales tax are already somewhat regressive and flat (as the more you make the less they hurt), and the flat tax argument gets that more difficult to make. TIP: The maximum amount of wages subject to Social Security taxes for 2016 is $118,500. Since there is a cliff, where when you make more you pay less, the tax can be described as regressive. Since the share paid by employer and employee doesn’t scale with income, it can be described as flat. This tax burdens lower-incomes more than higher ones accordingly. Same would be true for a flat income tax. With the above said, things get less clear cut when we consider that, in-practice, flat tax proposals tend to be modified flat taxes that take into consideration lower income groups and other taxes like the payroll tax. When we compare these modified flat taxes to our current progressive tax system (loopholes and all), the conversation gets more complex. Certainly a theoretical modified flat tax that lowered employee payroll taxes and consumption taxes, got rid of loopholes, exempted those below the current filing limit, and increased income taxes to account for this would be “more fair” than one that didn’t… but its still hard to make the case it is fairer than a true progressive tax. A flat income tax is a tax system with a constant marginal rate (per dollar rate) for taxable income. A true flat tax would be a proportional tax (everyone pays the same), but in practice implementations are often progressive (those who make more, pay more) and sometimes regressive (those who make more, pay less) depending on deductions, exemptions, and general loopholes. We call the pure proportional tax “a true flat tax” and the others “a modified flat tax”. A progressive income tax is a tax in which the tax rate increases as taxable income increases. The term “progressive” refers to the way the tax rate progresses from low to high, with the result that a taxpayer’s average tax rate is less than the person’s marginal tax rate. Progressive taxes are imposed in an attempt to reduce the tax burden of people with a lower ability to pay to those with a higher ability-to-pay. The opposite of a progressive tax is a regressive tax, where the relative tax rate or burden decreases as an individual’s ability to pay increases. What is the current income tax system in America? In America we currently have a progressive income tax system (see 2016 tax brackets). However, some like Warren Buffet claim, that even though the rich pay more, the current tax system is already “rather flat” and in some cases even “regressive” (with all deductions, exemptions, and loopholes and businesses related taxes considered; i.e. for instance Buffet’s effective tax rate accounts for a far smaller percentage of his total income than his secretary; he pays far more total in taxes, he just pays a smaller percentage, partly due to him paying the capital gains tax which is taxed at a lower rate). Two big things to note are the PAYROLL TAX which is a major burden for those with lower incomes and SALES TAX which is generally regressive (as well as other similar taxes including property taxes). Taxes like the payroll and sales tax hit lower-incomes the hardest, when we pair this with the fact that a true flat tax also raises this group’s income tax, we get the basis of the argument as to why a true flat tax is more unfair than a progressive one. See For Most Households, It’s About the Payroll Tax, Not the Income Tax. Taxes: Crash Course Economics #31. This video by PBS has economists look at progressive, regressive, and flat taxes, and how those and other taxes affect America and the world. This is probably the best tax video online. So it is a must watch. Unless you studied economics or do the books for businesses, this video will be eye opening. Both progressive and flat tax types have their pros and cons, and any meaningful comparison must compare many factors (more than we can fully compare here). With that said, a well structured progressive tax can be shown to be more fair than a true flat tax as a general rule of thumb, especially if (as noted above) we only consider income tax alone or assume no other changes to the tax system. The justification for the above claim is simple, with a flat tax tax everyone pays the exact same rate (fair as in “exactly the same rate”), while a progressive tax typically shifts the burden to higher earners who have a higher ability-to-pay (fair as in “an equivalent share of the burden” based on total income). The result being those who can afford to pay more do. A progressive tax reduces the amount that lower-income citizens pay, and thus reduces the need for subsidies; And it increases what higher incomes pay, and thus reduces the need for higher taxes in general and for other sources of Federal and state revenue. Meanwhile, a flat tax charges everyone at the same rate, which requires those with lower incomes to pay more, and gives the top brackets a tax cut. At best this incentivizes trickle down economics, at worst it just means less income for the U.S. and more income for the top earners. Although the term “fair” is somewhat semantic, we can assume the average person would say that those benefiting more from society paying a little more (rather than shifting the burden to the lower earning families with a lower ability-to-pay) is “more fair”. Thus, at its core, with no additional complexities considered, the progressive structure is “more fair”… even Andrew Carnegie agreed with this, although he would probably be enraged by our low estate taxes (see his Gospel of Wealth). FACT: The average American pays an income tax rate of 10.1 percent (according to a 2014 U.S. Congress’s Joint Committee on Taxation report), this is because the lower-income Americans’ incomes are off-set by subsides and refunds. While the total tax burden rises progressively with income, this is only true for those who file (and thus can get credits). Americans who earn less than $10,000 per year (and are thus below the filling limit) don’t get enough from their earned income tax credits at tax time to make up for the payroll and excise taxes they pay all year. This group still suffers under a flat tax, unless that flat tax involves sales tax and payroll tax cuts!… Then the conversation becomes nuanced and there are “other considerations”. As noted at above, when we talk about the actual current tax system (with its deductions, subsidies, exemptions, and loopholes), consider the incentives that different types of taxes (not just income) and loopholes create (in the private and public sectors), consider how different subsidization programs can offset things, consider the fairness of the brackets (the are skewed toward low-incomes currently), and consider alternatives like the Modified Flat Tax (a hybrid of sorts which takes considerations for lower earners) and a consumption tax (a tax that favors sales tax over income and payroll taxes), we have to have a much more nuanced discussion, and things are less clear cut. Below we will discuss the progressive and flat tax in more depth and look at different alternatives. Not everyone agrees on what tax type is best, so with that in mind, both sides will be considered, and we will give pros and cons of each. Comments are welcome below. Warren Buffet On Why U.S. Taxes Are Too Low For The Wealthy. This is a really good explanation. I get these guys may be considered “left”, but they are also rich and smart. So try to give them a few moments of your attention regardless of your political and economic ideology. TIP: As noted above, the income tax isn’t the only tax. There is payroll taxes, estate taxes, sales tax, investment income taxes, corporate income tax, and much more (especially for businesses). Almost all taxes favor the rich (and big business), aside the estate tax and a few others, and in many respects the current taxes are already “rather flat” (paraphrasing Warren Buffet, see video above). Even when we consider tax credits (like subsidies and assistance programs), many taxes are “regressive” and burden the lower and middle classes (and businesses) more than the top fraction of a percent. The federal corporate tax rate’s highest bracket is even regressive for very high earning corporations (although, as is commonly known, they don’t actually pay this anyway). Is that “fair”? TIP: Sometimes the conversation is skewed and political. “Flat tax” is sometimes used as code for giant tax cuts for higher earners and businesses (i.e. large corporate tax rate cuts, estate tax cuts, etc; not sales tax cuts or payroll tax cuts per-say) paired with subsidy cuts for low-income families (as described here). This type of cut isn’t “a true flat tax” or an earnest attempt at a hybrid, its just tax cuts for the rich which hurts America’s bottom line (even if it incentivizes businesses). FACT: Did you know America didn’t always have an income tax? You can blame Lincoln for that one. See the history of the income tax. Before we move on to examining fairness again, lets do a more complete comparison of how a flat tax and progressive tax are different in structure. A progressive tax is an income tax that increases as you claim more money. At each bracket, you pay the higher rate on each dollar over that amount. So you pay the percentage in the first bracket on the first chunk of money, the second bracket percentage on the next chunk, the third bracket on the next, etc. So the top tax rate only applies to money over X hundred thousand in America. Below is the current 2016 tax rate in America (for single, joint, and household head), see corporate income tax rate for 2016 (notice the corporate tax goes up and then down again, this type of regressive-progressive tax is also an option, it’s a mix of flat and progressive ideology). What is a Flat Tax? A flat tax is a tax rate where you pay the same taxable amount on each dollar of income regardless of income. As you can see, each dollar you make benefits you more, but those with lower incomes pay more. This hints at why it isn’t as fair as the progressive tax. TIP: Fairness of a tax aside, under our current global system, in countries with Flat taxes (like some Slavic countries, typically ex-Communist countries who went from Communism to flat… not from progressive to flat) and in countries with Progressive taxes (like most western countries), the wealth gap is widening. This indicates that taxes that are not the issue, but tax loopholes and policies fueled by special interest may be. The rich don’t pay their share, regardless of the tax system, and the poor don’t have money, so in many cases the middle pays everything anyway. Part of the problem with proving one tax system is more fair or equitable than an other is a matter of semantics surrounding the word “fair”. Those making more money can afford to pay more without the tax payer having to subsidize them, or without sacrificing their quality of life, ability to prosper, or social standing (and influence). This is true for income, but also true for any other tax type. Small businesses struggle more than big ones, so what is true for low-and-middle-income families is also true for about 90% of America’s businesses (so payroll, corporate tax, and sales tax for businesses should also be considered in a flat tax vs. progressive tax debate). A flat tax would ignore the differences between rich and poor taxpayers, which would be (all things considered) more unfair than a progressive tax treating the rich and poor differently. Essentially, rich and poor are different, and so treating them different is fair (see how equality actually works). Are the Flat Tax Alternatives More Fair? As noted above, we should other common alternatives to the progressive tax system, namely “a consumption tax” and “modified flat taxes”. A consumption tax (like the aggravatingly named “Fair Tax“) has the same types of problems. The poor spend more of their total incomes on average, and they typically have less money to spare in any given time period. A low income individual who spent all their money would, pre-bates, rebates, and exemptions aside, be taxed at X rate on 100% of their income (as they would “spend” all their income on necessities and other goods and services). Now just consider how this works with credit! Spending more than you have, and then some on the new consumption tax while the 1% pay no income tax! However, a Modified Flat Tax, as a hybrid of a progressive and flat tax, and other alternatives reduce some of these problems. Flat Tax – UT McCombs School of Business. In What Ways is a Modified Flat Tax More Fair Than a Flat Tax? A flat tax treats low income brackets and high income brackets the same. However, other factors can curb the inherent unfairness of this, including those implied by some types of “modified flat income tax” plans. A modified flat tax describes a range of different hybrids that seek to make the true flat tax a little more fair. Some adjust all tax types, and some address issues such as the lowest rungs of income paying more by using subsidization, rebates, or exemptions. Is a Flat Tax Fair? Warren Buffett on the Bradley Plan, Payroll Tax, Social Security. A discussion on the “fair flat tax” (a type of modified flat tax). One solution involves a UBI (a universal income) or Guaranteed Basic Income (where criteria is more strict, such as being willing to work) where the business and high-earner favoring flat tax is paired with a basic income. This idea can work in many ways, but it is notable for being a compromise position. So, because it is more nuanced, we can say a thoughtful modified flat tax plan could in some ways be a fair system, certainly fairer than a true flat tax, and perhaps even more fair than the current system. How a flat tax would be fairer than our current system – Whiteboard Wednesday. TIP: A UBI is a little like the old free-silver argument… but then again, a true flat tax is a little like the old gold-backed argument. American history is largely the history of the debate between individualism and collectivism. The individualist typically favoring tax cuts and less subsidies, the collectivist typically favoring the lower rungs… but cronyism and special interests add layers of confusion. See Free Silver Movement | United States history. Musing on a UBI: I would personally only think a UBI would make sense if it was regressive (tapering off very slowly to avoid a cliff) and was paired with progressive taxes. To me, the main point of a UBI is simplifying the bureaucracy of our current subsidization programs. While giving people something for nothing goes agains the grain of economics, we have moral social responsibility. That is a conversation for another day, as that is the philosophy of the purpose of taxes and the difference between “government” (a natural system vital to humans arising from the state of nature as the pinnacle of modern moral life; the actor Aristotle’s polity) and “big corrupt gov’ment” (the type that wastes $.95 on every dollar and incentivizes some not to pay their taxes and hide their tax returns). FACT: Thomas Paine presents one of the earliest arguments for taxation and a guaranteed income, oddly enough, in his masterwork Agrarian Justice (1797). More Ways is a Flat Tax More Fair Than a Progressive Tax? People who get sudden wealth are less burdened. This is just straight up better (but an exemption for the first ‘X’ dollars in a progressive system would solve this). Those trying to amass wealth for the first time (new money) will find it easier to get richer (although the rich, on paper, have the same advantage and more assets to leverage). “It treats people the same.” This sounds good in theory, but in practice, it’s a bit like putting a lion and a kitten in a room with two plates of food. The lion will eat the kitten, the food, and maybe both plates. Ensuring liberty and justice for all is complex, and involves not just non-aggression, but the minimum mutilation of values, morality, ethics, and honest comprise. It would unburden business owners and incentive storing and creating wealth in the U.S… in theory. In practice trickle down didn’t work so well. The Progressive Income Tax: A Tale of Three Brothers. This is an example of a false narrative. In reality, we need to add a fourth brother, let’s call him Billy. Billy makes tens of millions a year, takes advantage of generous loopholes, owns the land of the brothers, taxes them, and uses his power and influence to make the brothers pass laws that favor him. I’m not sure a progressive tax will help the brothers, but lord knows a flat one won’t either. If Tom hits the lotto, the progressive tax shows a big weakness. The money that could have caught him up to Billy is taken away while Billy uses loopholes to avoid such nonsense! Neither tax is fair, but the way in which the right-wing pushes for a flat tax is a little telling. If PragerU wants, to be honest, make a video with a Billy in it and address the problem with price fixing, monopolies, feudalism, and other such things. TIP: Those who push for a flat tax are often pushing a false narrative, “that treating a rich person differently than a poor person is unfair in regards to taxes”. This doesn’t make sense in practice, only on paper. Capitalism is inherently unfair. When it comes to money, we start with an unfair distribution and have to curve toward fairness to sustain Capitalism for the long-term. When the rich get richer, they create special interests that influence the law, making them even richer. It is the duty of governments to foresee this time-honored sticking point and curb this behavior. Is the Current Progressive Tax System in America Fair? As noted above, although an ideal progressive tax system is fair, the current progressive tax system in America, especially with loopholes and all other taxes considered, is less fair. The current system is actually rather “flat” and many taxes are rather “regressive”. The tax rate curbs up really fast and then it quickly flattens out. (Thanks, Reagan and Bush for what your tax cuts really did). Some mega-rich know the loopholes, and they pay effective tax rates in the 0-15-25% range while the upper-middle class pays taxes in the 30-40% range. This causes many to see a flat tax, or another tax system, as more fair than a progressive tax. A flat tax with no loopholes would be much more fair than the current American system, and other types of taxes have fairness and unfairness factors as well. A sales tax is a very fair tax, but one can skirt this with the internet and certain investments. A payroll tax is a burden on employers and employees who are taxed for working and creating jobs, but the self-employed and investors don’t feel a thing. Tax on Wall Street hurts investors, but not the average joe. The estate tax is a burden on old-money, but the poor didn’t own much in the first place. Tax on consumption hurts the poor, but also could disincentive some more well-off from spending. Etc, etc. When talking taxes, capitalism, liberty, and politics, we can’t expect things to be “totally fair.” Instead, we have to consider ethics and think about “what is fairest” for individuals, the collective, and future generations. Or maybe at the core, what taxes and regulations incentives a just society can impose while sacrificing only a minimal amount of liberty. Regardless of how we go about things, tax dollars are needed to keep the system going, and to pay off the national debt. See where else your tax dollars go from the Center on Budget and Policy Priorities. Regressive Tax. And then there are all the other regressive taxes. TIP: Ironically, “a fair tax” is also unfair. The fairer taxes tax consumption, but this isn’t where most money is made in a modern economy. This would have worked better in the past. The 4 Main Types of Taxes We Pay. Unless you own a business you probably don’t realize this extra burden, the payroll tax. Both employers and employees pay this regressive tax which typically burdens both businesses and employees with lower incomes. This is one of many less talked about taxes. This video explains much more. Is There a Truly Fair Tax? A truly fair tax is a tax that first and foremost doesn’t burden the poor, next infringes on liberty as little as possible, next contains no loopholes and funds no special interest projects. It’s a tax that benefits people and leaves no room for exploitation by big business or politicians. It makes the nation wealthy and doesn’t overburden its citizens. It prevents wealth and income inequality without sacrificing the principles of Democracy or Capitalism. It is a simple progressive tax with no loopholes that considers all income of all types. In many ways, it is not the tax system, but rather the systems around it which drive inequality. As long as the loopholes remain in place, there is nothing fair about a progressive tax that the top level incomes don’t pay. In this regard, we could go in any direction and improve the tax situation, or conversely, go in any direction and drastically make things worse by increasing taxes, that the rich and poor won’t pay. When you tax, but don’t fix loopholes, you squeeze the middle. FINAL NOTES: I’ve rarely talked to a person who wanted to shift costs to the poorest, squeeze the middle class, and ensure a hereditary oligarchy, yet people often support policies that do just that. There is nothing easy about constructing the perfect tax plan, but of course this is why we need open, honest, and non-ideological debates that address CBO debt projections, the wealth gap, our current legacy system (spending and revenue), the cannons of economics, and the current economy. That is how we find a truly fair tax system that is fair not only for us, but for the next generations. A progressive tax is fairer than a flat tax when we consider all the implications. A progressive tax has its downsides, and in practice it can be a real problem, but the solution isn’t the less fair “flat tax.” The solution is reform. Wealth inequality is a serious issue; any system that adds to that problem will always be inherently unfair, yet addressing inequality too aggressively is just as unfair. Should we replace the federal income tax with a national sales tax? This is the dopes article I have ever read. What a waste of time. You make statements of ” fact” without evidence. Thank you for the comment. I’ll try to make the argument clearer. Wait, since when do you vote on whether something is a fact or a myth? A fairer system would exclude low income workers from paying income taxes (below some threshold, say $30,000 taxable income in the US) and tax everyone who earns more than that at a flat rate. With a flat rate, those who earn more pay more. With a progressive system, those who earn more pay WAY more. Be careful interpreting Warren Buffett’s statements on taxation. He isn’t saying he pays less tax than his secretary (he doesn’t, by a long shot, unless he makes less than her). He’s saying he pays a lower effective tax rate. That can be fixed with a flat tax system that applies to capital gains and other earned income. By taxing people who earn more in salary at a higher rate, society is essentially levying a “success penalty”. You’ve stayed in school, worked hard, sacrificed, and now earn a good living. Why should you be penalized for that? This bears a significant burden on people who derive their income from salary and business operations (e.g. : small business owners). The “rich” people who pay a lower effective tax rate (such as Warren Buffett) are generally the super wealthy who end up making the majority of their money by way of capital gains (read: stock market dividends and the like; read also: people who don’t have to work for a living). All really good points, I added a note to the page to clarify the article to make sure it was clearer on the points (I felt it already was, but I made it clearer). So I’d say the argument above applies to all taxes in general, including capital gains. Although i’d consider each tax individually for a full debate, I’l offer the gist of the argument. The gist is, all taxes considered, those with a higher ability to pay should do so. You live here, you benefit from the debt, you need to pay your fair share. No, the rich do not need a tax cut, not until we see a surplus and relive some crushing debt from our bottom 50+%. If only in the interest of fairness. As for your suggestion of a fairer flat tax system that excludes the bottom X, that is more fair than not excluding them for 100% sure… but they are already excluded under the current system (effectively) and the bottom (as noted above) is already paying disproportionately in other taxes like sales and excise. Their ability to pay is lower than higher incomes, but there total tax burden is disproportionally higher. Like with Buffet, they don’t “pay more” they pay a higher percentage of total income all taxes considered. Those with lower incomes spend not only most of their income, but many spend more than that on credit! Still, how hard you work, and even a little luck, are reasonable factors in a free society. I would never claim it is fair that a person who works hard and/or gets lucky and earns a high income should be punished for it. It is just that, in a society where the government indebts us and the lower incomes are indebted, I can’t see how it is fair to squeeze the middle and bottom and give tax breaks to the top via a flat tax. Ultimately, what is “fair”, is that if those who work hard earn more, but not to an extent that those working hard at the bottom are punished. A flat tax doesn’t offer the nuance to accomplish this fairly, in my opinion. And again, I apply this argument generally so I do include capital gains, estate, corporate, etc, although again, I’d look at each as its own issue. If I make another million this year, really, really, I do think it is fair to pay a little more if that means the teacher gets a little tax break. If I make 10 million, then more, 100 million more, 1 billion more, 100 billion more, 1 trillion… well now we are in a position that we are bankrupting the economy, so i’m going to not only be ok paying more, i’m going to be seriously investing and engaging in philanthropy. It would be awesome if we could each be moral without the state to set some guidelines, but it makes sense for us all to agree on fair rules in lieu of this. To avoid the punishment aspect the tax should gradually increase slowly. Right now it increases steeply to become “rather flat” quickly, which is a giant con and what we should be complaining about (but of course, i’m comparing here that the rates are already rather flat). A gradual incline would help prevent an incentive to earn. But honestly, even with all the taxes of the Obama era, I did very well myself. I’m not suggesting taxes as a low wage worker, i’m suggesting their fairness as sitting somewhere comfortably in the top single digits of the income spread. All my points said, when we are debating specifics, there is lots of room to debate fairness. I think our argument generally wins the day in broad terms with all taxes considered, I don’t think it wins on every point, nor does the article elude to this word-for-word. Thanks again for the thoughtful comment, all insight and arguments are welcome, especially contrarian arguments. Many of your arguments seem to revolve around a comparative to the current (i.e. tax cut for some, shifting the burden to others). If the current system is unfair (people paying different rates), then any change to the tax system will inherently cause dispropotionate results in the comparative. 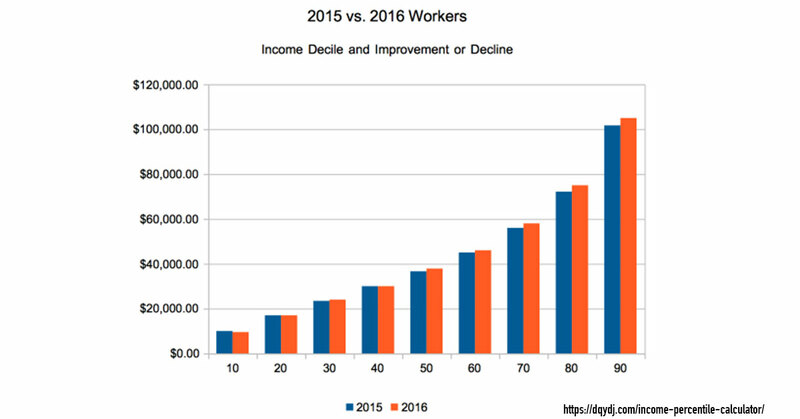 A percentage is already ‘progressive’ – in flat dollars someone making more will pay more. I was not convinced that simply because someone has more income that society is now entitled to a greater share…simply because of some Robin Hood/redistributionist imperative. I’m not convinced wealth inequality is as big of an issue as you seem to argue or that there aren’t other methods for protecting against an oligarchy. Philosophically, if we are all in this together then I see no reason (no matter your income level) why you shouldn’t contribute. This incentivizes participation in a republic/democracy. Is this harder on those without (or less) disposable income? Yes. Does that negate the fact that they are still part of society? No. Regardless of the system, I am against loopholes/execptions because I think they tend to cause more problems than they fix. Thanks for having the courage to put your thoughts down. Everyone benefits from the civil exchange of ideas. Thanks for the kind words and thoughtful comment. Those are some interesting things to think about. So I can’t understand the fairness argument. You are not shifting extra burden onto the lower income individuals unless they ARE in fact paying more. The ideal solution would be to have people pay who can afford to, exclude those who cant, and work with the money we have. Ideally we would have a 10%-15% (Cruz originally said 15% because he quoted the bible) income tax. Exclude those that make under say 30k (or however we determine TRUE poverty) and everyone above said mark pays the same percentage. The part you ignore is that the current progressive system is not only actually regressive, but it hurts the middle class and the growing lower income class the most. If you become successful you are punished, but not only are you punished you also don’t have the same breaks the rich do. Instead of preferential treatment everyone pays % above a dollar amount. Looking at our current tax system we would lighten the burden from a lot of lower-middle to middle-high income families while also forcing the “rich” to pay the same share. The best solution for all would be decreasing our expenditure as much as possible. Poor people end up poor because they live above their means. Apparently the U.S as a country can’t figure that one out. Interesting thoughts, thanks for sharing them. The point of the article is to argue that a flat tax for everyone is less fair than a progressive tax… but I think when you add in variables like “a flat tax, but only over a dollar amount high enough not to burden lower incomes” then you can really start to come up with some interesting counterpoints. Ultimately it is a subject that is up for debate, so enjoy hearing the arguments honestly.